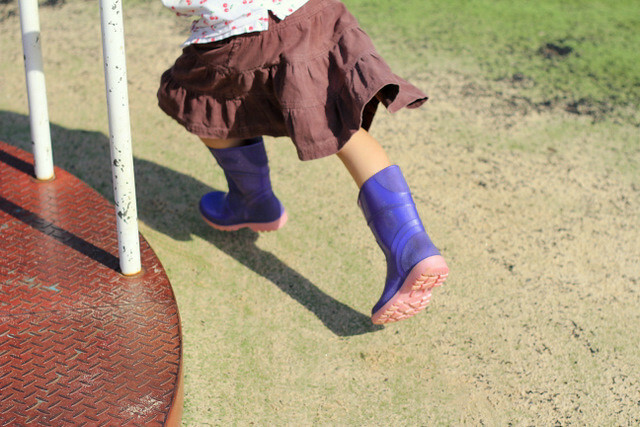 "It's great to encourage our children to tinker physically with items, skills and crafts, as well as mentally with ideas and dreams and their own big picture. So many of us have lost the art of tinkering. Perhaps that's because its loss suits the 'modern' economy in so many ways. After all, business prefer us to buy new things rather than fix what's broken, they prefer us to buy in a box what we would otherwise create and construct ourselves, they prefer us to pay people to do the things we really could do ourselves". Anna Campbell, Honeycomb Kids. I've just finished reading Honeycomb Kids: Big picture parenting for a changing world...and to change the world by Anna Campbell. 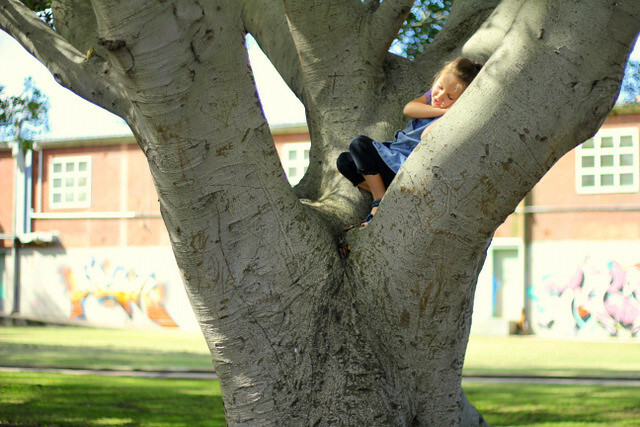 Anna's book is full of practical tips for how we can ensure our children have the skills needed to become resilient, considerate and happy adults. I found Anna's discussion of 'Smart Thinking' particularly useful. 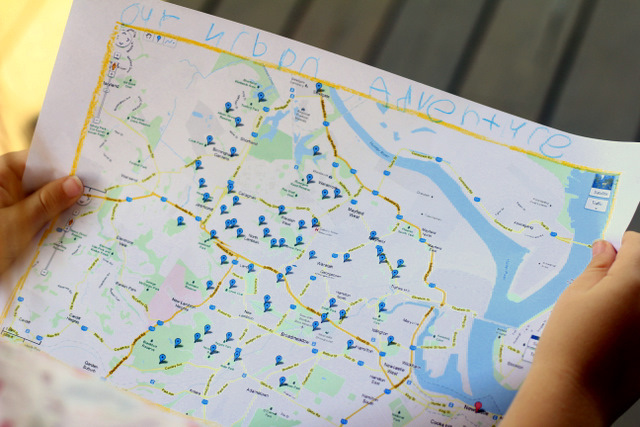 "Our children will benefit if we encourage them to think, not just to learn. Mastering thinking is more important than mastering a specific technology that could well be outdated by the time they finish their studies. By learning to think, they'll be able to find the answers to many difficult questions". 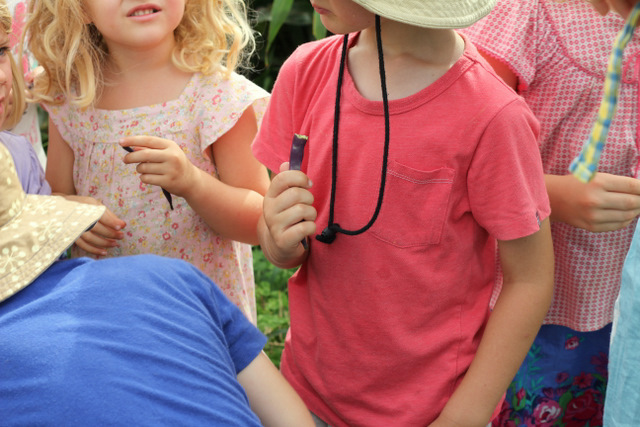 I've applied some of Anna's tips for introducing the skill of thinking to children and have been amazed at some of the conversations Little Eco and I have since had. I'll share more in a future blog post. Anna will be talking here in Newcastle Tuesday 19th June about her book and about how we can raise resilient kids for a better world. Her talk will be followed by a Q & A panel. More details here and in the flyer below. I'm one of the Q & A panel members. Will I see you there? 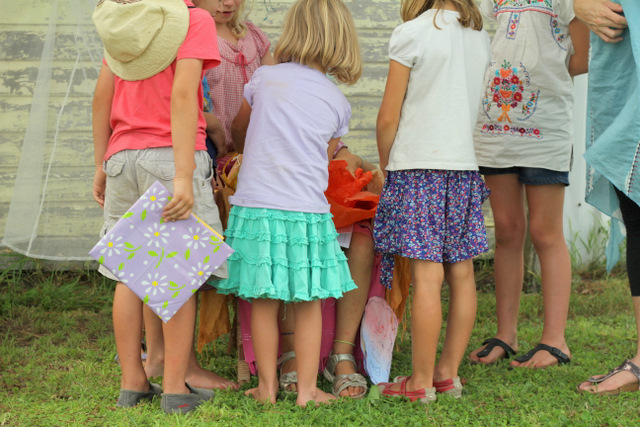 Little Eco enjoyed a Purple Pear Farm Party for her recent 5th birthday. 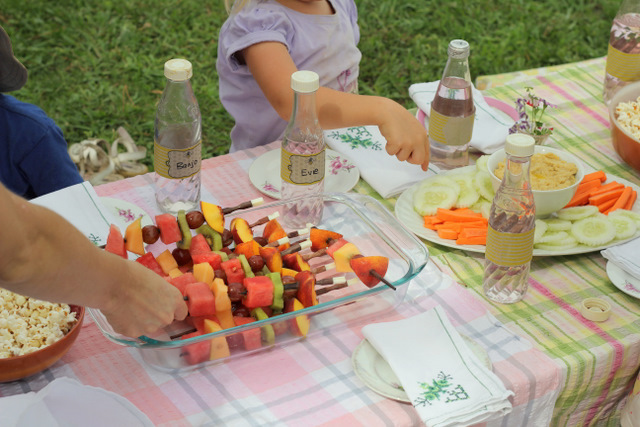 The party was simple, waste-free, natural, preservative-free and best of all Kate from Purple Pear did most of the work, leaving me to enjoy the day with Little Eco. The food was simple - fruit kebabs and pop corn. A natural cordial was served in recycled glass bottles with paper straws. Farm animal drink bottle name tags, made using the you make do's old-fashioned farm party kit, were printed on recycled paper and tied on with hemp string. 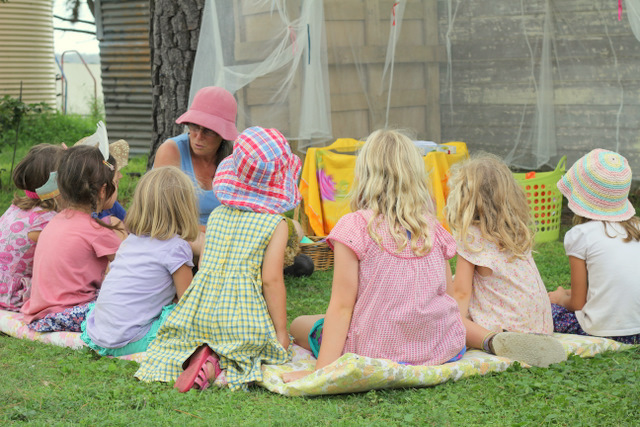 There was a quick game of old-fashioned duck-duck-goose while we waited for guests to arrive. 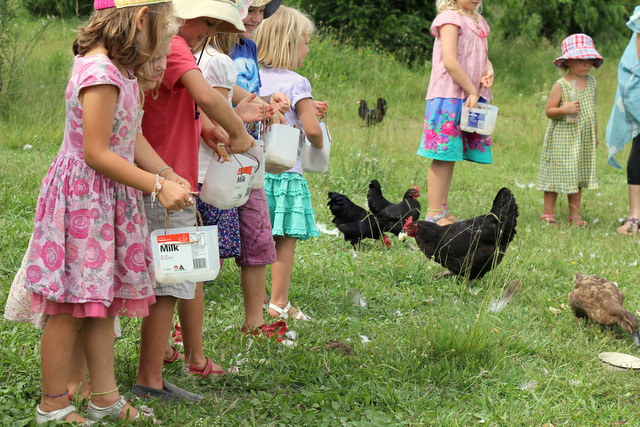 After a snack the kids went on a tour of the farm. 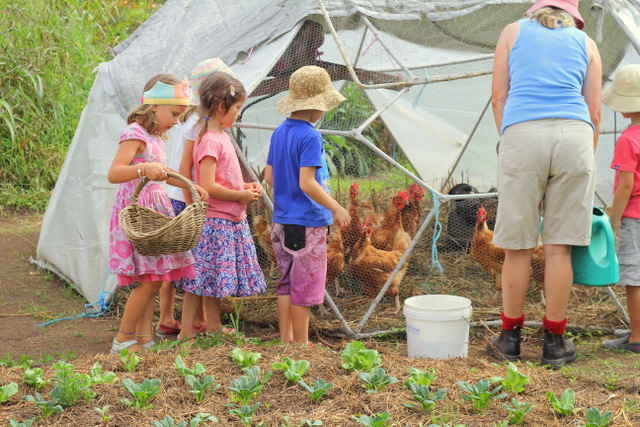 They fed the ducks and geese, collected eggs, climbed on the tractor, we're thrilled to meet a 'real' farmer, cuddled some guinea pigs and fed the pony. 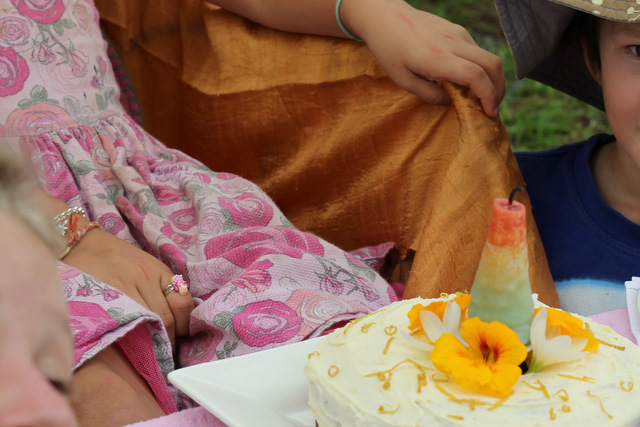 The birthday cake was a marble cake I made using natural food colours. The farm animals are schleich models that Little Eco has kept as a memento of her farm party (and were, for me, a quick and easy way to decorate the cake). The 'grass' was created by shaking some shredded coconut in a jar with green food colouring. Then there was a seasonal story about bulbs and each child got to take home their very own baby bulb to care for. I love that I could out-source Little Eco's birthday party, at a time that was extremely busy for me, without compromising on any of my ideals regarding waste, food and play. The party was much easier (for me) than last years attempt at a good-old-fashioned simple and frugal birthday party and her gardening party the year before that. Thank you Kate for creating a truly magical party. I hope that many more children get to experience the joy of one of your parties. 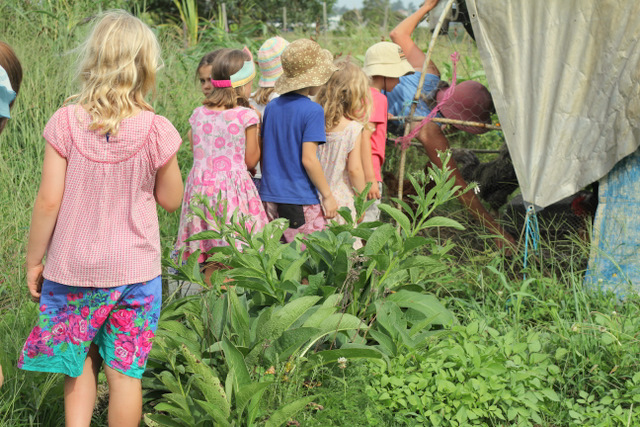 For more information and to book your own organic farm birthday party contact Kate from Purple Pear Organic Farm. 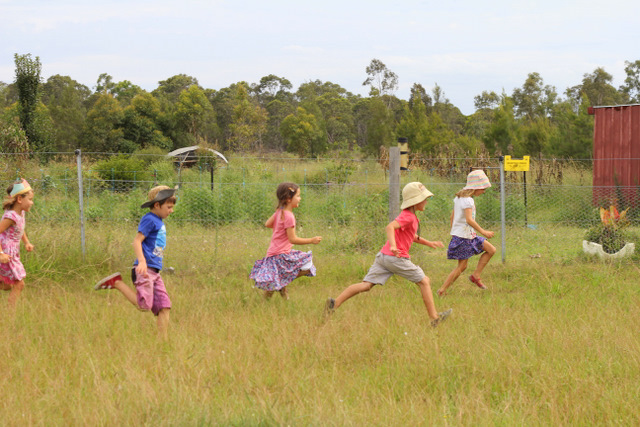 Purple Pear Organic Farm is in the lower Hunter Valley NSW, around 40 minutes from Newcastle. View pictures from a previous Purple Pear farm party here. 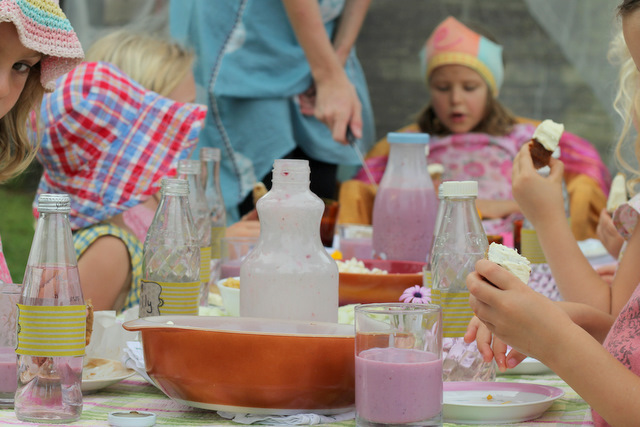 Whats your top tip for making birthday parties less complicated and easier? And speaking of parties - a set of Lyra pencils would make a great birthday gift. Head on over here to enter a giveaway for a set from Dragonfly Toys. 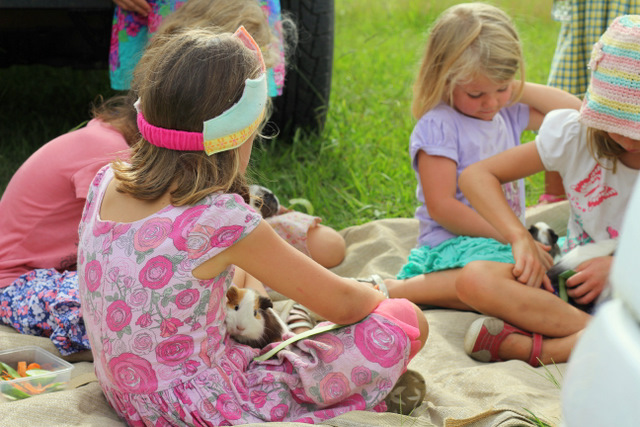 Purple Pear organic farm hosted their first kids birthday party recently. I had the pleasure of helping Kate run the party. 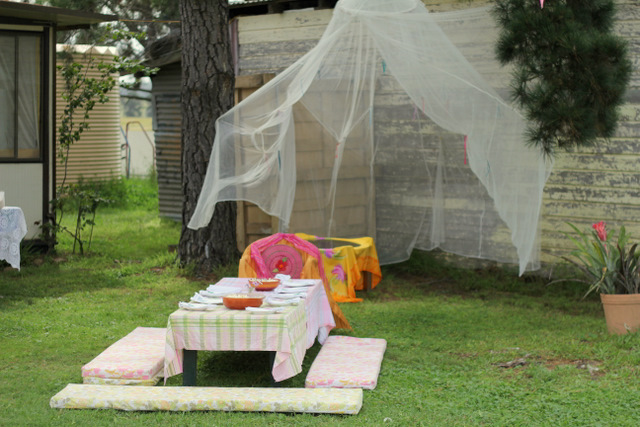 The party was simple, waste-free, natural, preservative-free and best of all the birthday girls' parents didn't have to organise a thing. The food was simple - fruit kebabs, pop corn and vegetable sticks and hummus. 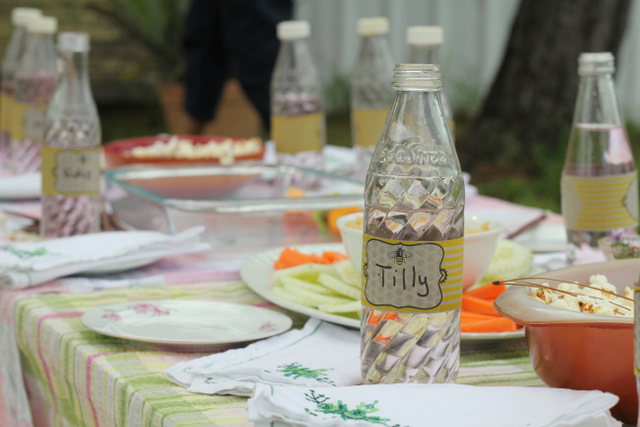 A natural cordial was served in old glass soda stream bottles. 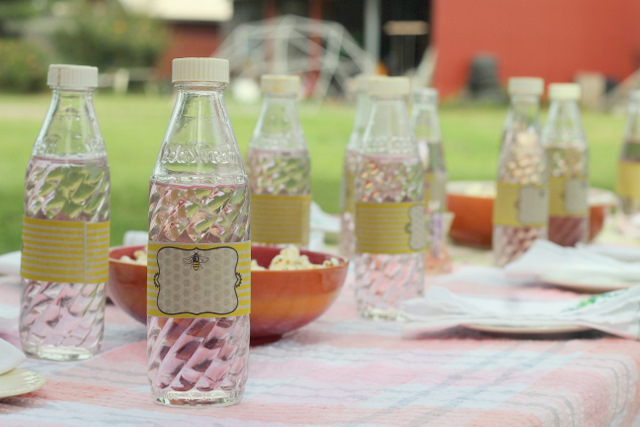 The gorgeous sweet bees drink labels printed on recycled paper are from you make do™ and inspired a sweet bees party kit. A special birthday chair was dedicated to gift opening. 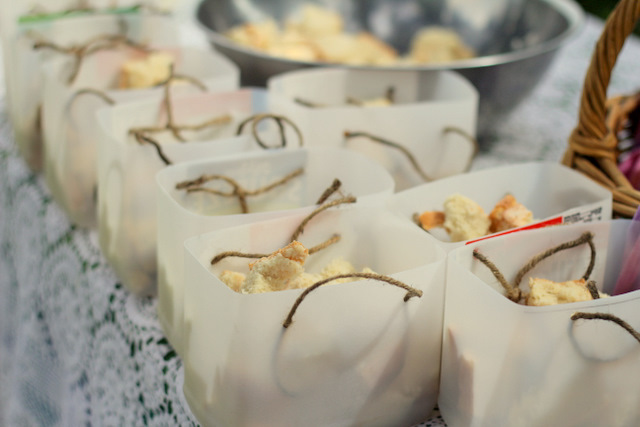 Kate re-purposed some old milk bottles as baskets for animal food (stale bread collected from a local shop). 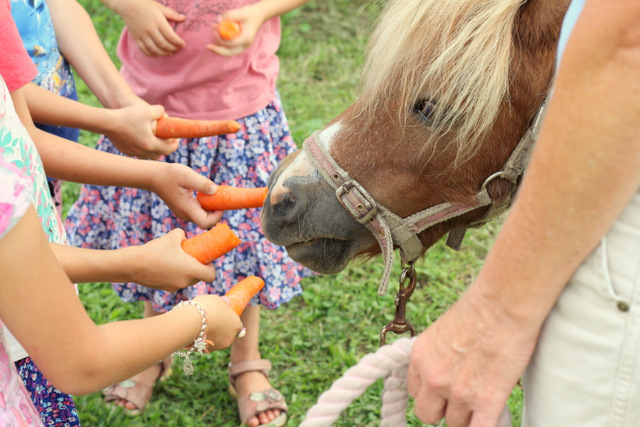 Guests got to feed the ducks and chickens, collect the eggs, munch on beans straight from the garden, nurse guinea pigs and feed the pony. The birthday cake was a beautiful simple banana cake decorated with edible Nasturtiums and enjoyed with a honey berry smoothie. 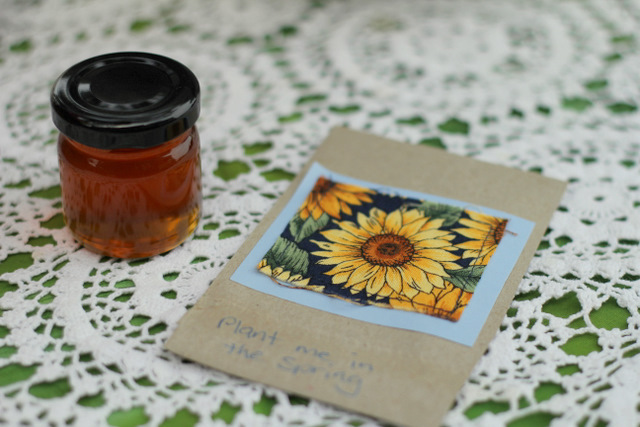 Kate then told a seasonal story about Sunflowers and the party guests got to collect their own Sunflower seeds to take home with a teeny jar of honey. 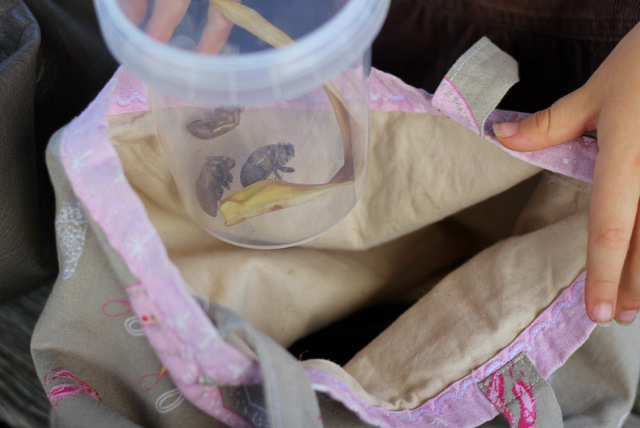 I've excitedly booked a party for Little Eco's upcoming fifth birthday party. I'm thrilled that I can outsource and still get a simple and waste-free party. 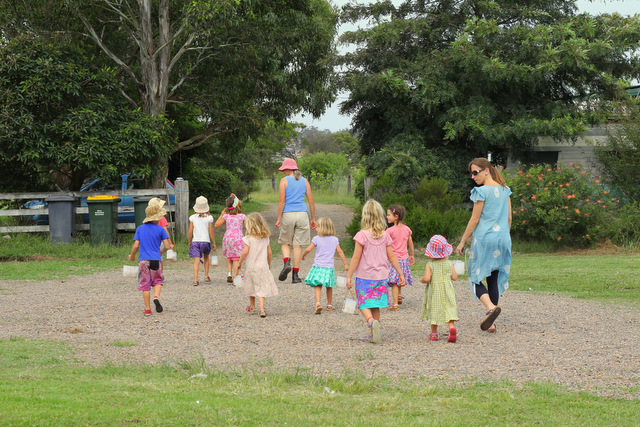 For more information and to book your own organic farm birthday party contact Kate from Purple Pear Organic Farm.